They live! I have been trying to sit down and send out an update for months! Just an indication of how our winter has been going, way too busy for a couple of folks who are supposed to be “taking it easy”! I would like to think that I have gotten caught up on all of the things that we need to do but I know that would just be a bold faced lie! As a friend of ours once said “our recreation is getting in the way of our recreation”! Let’s see, since our last newsletter we have both had several major excursions and many minor ones. In December Betsy and I both flew to Texas where I gave an all day workshop for the Austin Farmers’ Market. We have good friends there who are large cut flower growers and we held the workshop at their farm. After five days with them, including a quick side trip down to Mexico, Betsy flew home and I headed on west to Big Bend National Park. 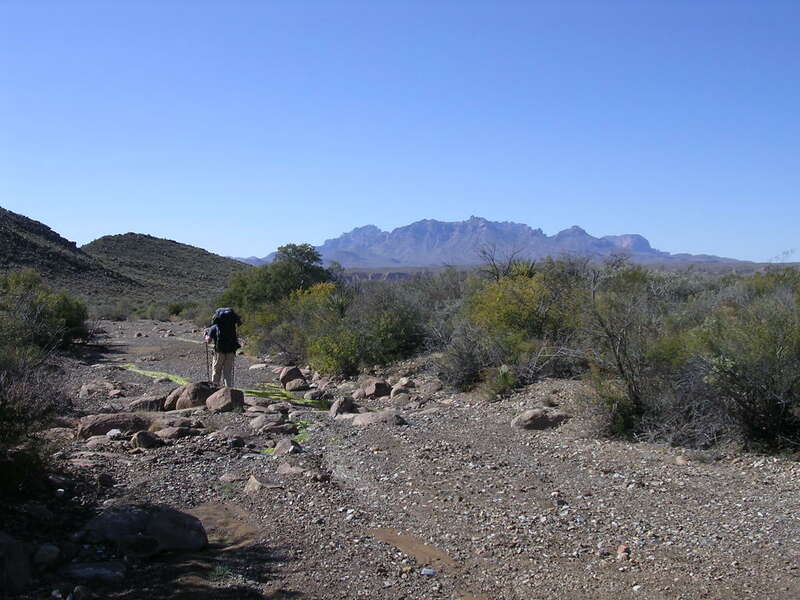 I have been going out there, to hike, for over 30 years (starting when I was in high school in Houston). We had a great 60 plus mile walk across the desert and up into the mountains. In January I went to New Orleans for the Southern Sustainable Agriculture Working Group (SSAWG) conference. I didn’t have to give any workshops this time around but as a board member we are always busy. The end of the month Betsy flew back to Italy! A professor friend of ours is doing a sabbatical in the main cutflower growing region there and as we weren’t very successful in October in seeing much flower production this gave Betsy a great chance to get on some farms. After several days in and around San Remo she took the train up to see our Italian family, the ones we stayed with in October. I am not sure that I may not lose her to the Italians! We have had lots of other extracurricular distractions sandwiched in as well, workshops to give, grants to review, etc. On the farm we have been trying to pay attention to business but quite frankly have been having a hard time as we have been having too much fun! We have managed to get quite a bit of work done on both the house and the packing shed. The weather has made it difficult to get any planting done in a timely manner and we are running a bit behind with some crops. Betsy has the greenhouse full of transplants and we have managed to get the first 3000 or so lettuce plants in the ground as well as seeding some other flower and vegetable crops. If it doesn’t warm up soon I am not sure what we will have to sell the first few markets. We are using all of the tricks that we have to get things to grow faster but really we just need some normal March weather. 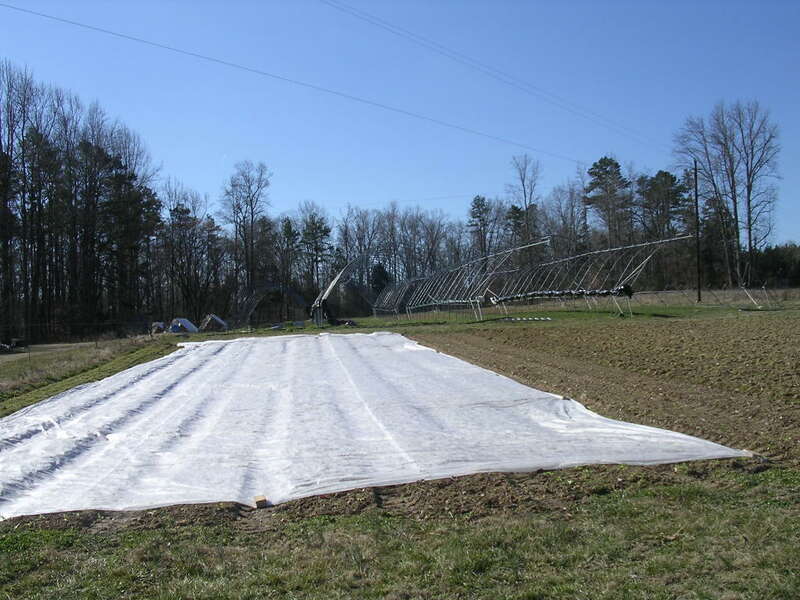 The high tunnels are protecting flowers and vegetables (spinach, lettuce, turnips and more), in the field we are covering the lettuce with huge floating row covers of spun bonded polyester. These 30’X100′ sheets are very effective but also can try a marriage! Imagine trying to put these out in the kinds of winds we have had the last few days! We are planting several new things this year and are excited to see how they work out. I have a new planting of asparagus going in, new blackberries, rhubarb, and artichokes as well as new varieties of peppers and tomatoes to try. Betsy has thousands and thousands of tulips and lilies planted along with other new flower cultivars. Believe it or not the first market is only two weeks away, March 19th! Yikes! I will send out another newsletter just before then to let you know if we will be there and what we might have. Boy are we tired today! Yesterday was the big moving of the tunnels day. 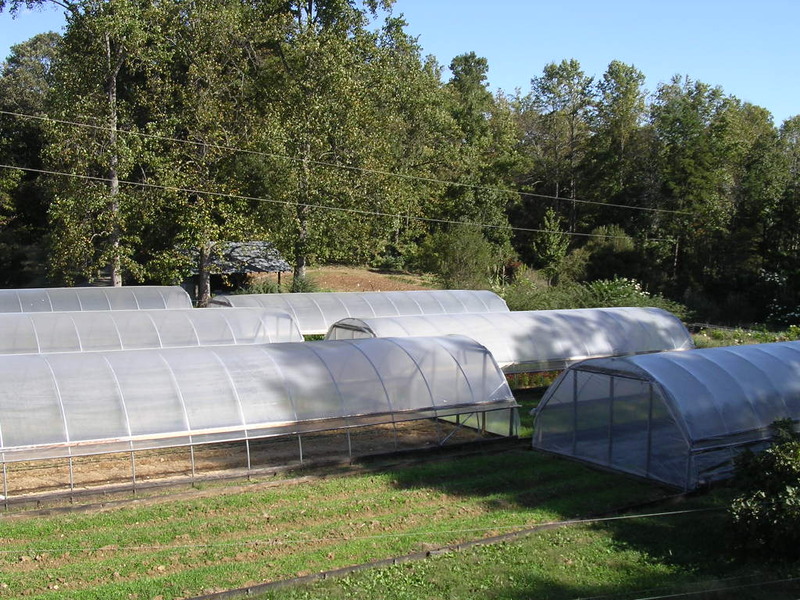 We have these six 16’X48′ greenhouse structures that we slide back and forth on rails so that we can cover sensitive crops and yet still have all the benefits of outdoor culture. We only move them once a year but usually it takes parts of two days to finish the job as there is endless unbolting and rebolting of the parts so that when high winds come they don’t end up in the next county. 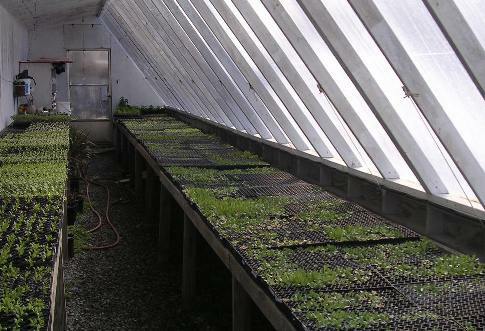 One of the problems with greenhouse or protected growing is that you can build up disease and insect problems as it is the perfect warm, moist environment for them to thrive. 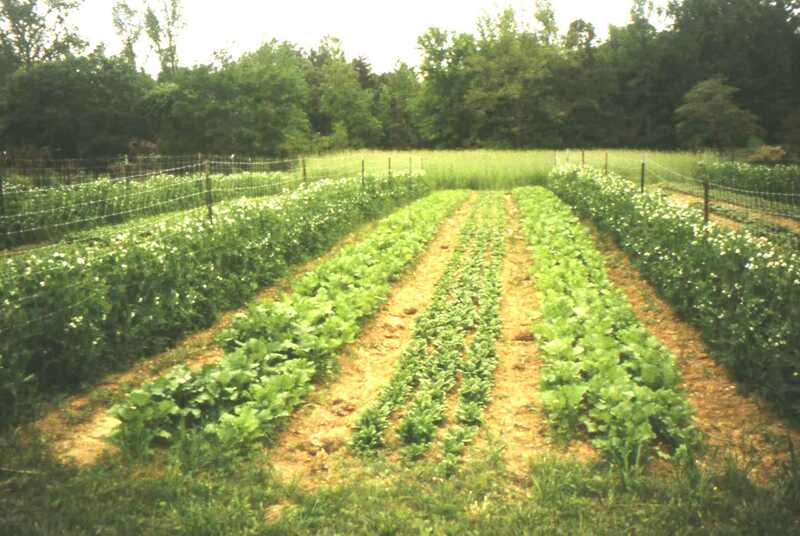 By uncovering the growing areas we get all the natural soil building conditions (freezing and thawing, snowfall and rainfall, full sunlight) and we can grow our soil building cover crops as well. It is a lot of work but in a sustainable system we need to work with the ecosystem in all the ways that we can. The reward for all of us are things like tomatoes that taste great a month earlier than we could have them from the field. One of the reasons that we are so tired is that we got it all done in one day so that today we can plant another quarter acre of asparagus before the rains come tonight! Because these asparagus will be in the ground for the next 10-15 years we don’t want to rush through the job of preparing the soil and planting, even though that is how it feels! We started the preparation two winters ago with soil tests and mineral amendments, then growing cover crops to build the organic matter and to help reduce the weeds, today we will lay out 2200 plants (crowns they are called) in six inch deep trenches and cover them lightly. As the season goes on we will continue to pull more soil over them until the trenches are filled. With any luck we will harvest the first few spears next April! The rest of last week was filled with deer fence maintenance (stinking deer! ), tomato trellis building and planting of some new blackberries. 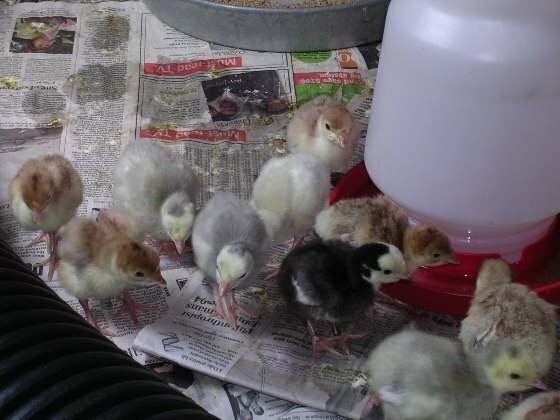 As you may know we started Peregrine Farm as a pick-your-own berry farm. After fifteen years in the blackberry business we thought that we would never plant another one on the place but Betsy has missed not having some berries, at least for us. As I can’t ever just plant a few of anything I thought that I was restrained by just putting in a 100 foot row. Two new very promising varieties maybe we will have some next June (2006) at market! The staff is back in full force with Joann keeping us straight, Rett (back from two months in Brazil) keeps us laughing, and new this year is Rachel who is attached to one of our alumni, Lee, and came highly recommended. It is all we can do to keep up with these kids. 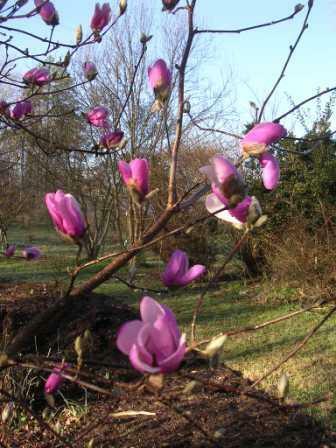 Spring is really here now! The sliding tunnels, the wooden rails are visible at the bottom of the picture. You know some days are more glamorous on the farm than others. Like the Carolina Farm Stewardship Farm Tour days (weekend after next, April 23 and 24) when the place is all buffed up and lots of interested folks come out to see what we are up to, or when the NC State Agroecology program comes out to shoot a video of our operation for students to be able to access online. These would qualify under the heading of “farmers as rock stars” as one friend of ours likes to say. Yesterday on the other hand was more along the lines of drudgery, running a jack hammer to be precise. 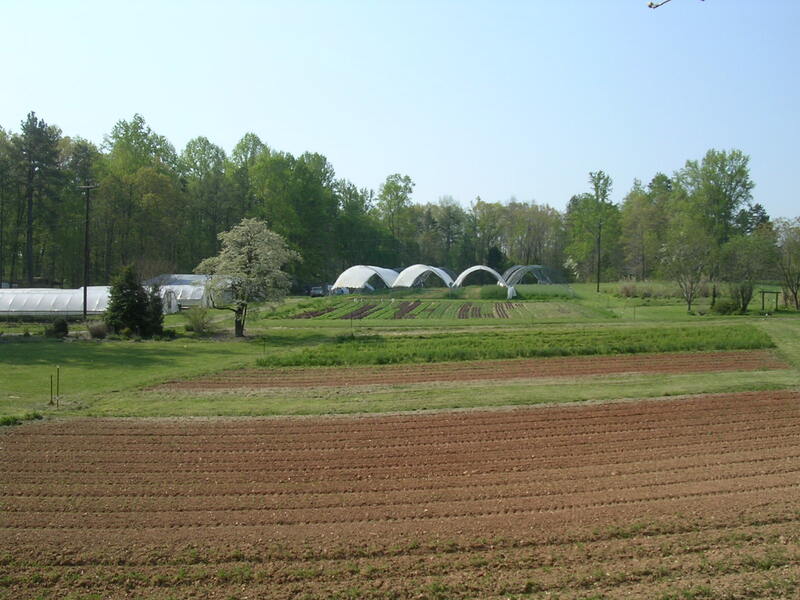 The “Big Tops”, technically referred to as field scale mutli-bay high tunnels, that we grow our tomatoes and some flowers under have legs that screw into the ground 30 inches deep. Each of the two units we have cover a quarter acre each and has one hundred plus legs that have to be screwed in. Sometimes you hit part of the planet. Last year when we put them up we had to rent a jack hammer and chip out 32 holes. It might have been one of the longest and exhausting days of my life! This year we only hit big rock once but yesterday, after I had put if off as long as I could (we have to plant tomatoes next week), up to the rental place I went. One hole was not too bad but I am still scarred by last year and am rethinking the wisdom of moving these things every year! It always feels like warm weather is coming when the first Zinnias are seeded. Last week we planted the first 10 beds and they are up already. We also planted lots of other warm season crops- sunflowers, tuberoses, calla lilies, lisianthus, cucumbers and artichokes. In general though we worked between the rains on lots of maintenance tasks, part spring cleaning and part crop management. We finished most of the big round of weeding which always stirs up lots of rocks which we pick up and have to haul away along with other detritus like branches, pieces of irrigation line and other items laying around before the grass grows over them and they become mower bait. Pea trellises went up, some irrigation began to be set up (I know it’s raining but we will need it when it starts to get hot), and hydrangeas were cut back. Not a bad week in all and the new asparagus are up! I can feel the tsunami rolling towards the farm, just over the hill now! There is always a week about this time of year when the honeymoon is over and we are in the middle of it. 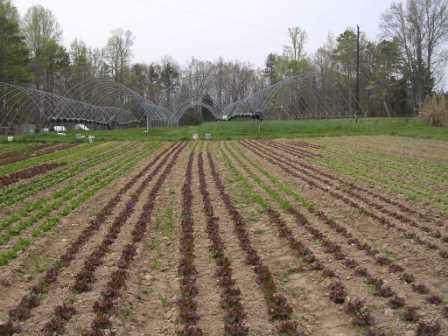 It is a combination of getting ready to plant the big batch of tomatoes and the weather finally warming up enough so that things really start to grow and need attention like irrigation water. Let’s just add the Farm Tour on top of the pile while we are at it! Saturday and Sunday is the Farm Tour. Our annual opening of the doors to the general public to come see the farm. Many of you have been on the Farm Tour before and it is a great opportunity to see many of the folks who sell and the Carrboro Market. Few folks know that the tour was actually Betsy’s brainchild. Eleven years ago she thought it would be great for customers to be able to go see the market vendors’ farms. In the end Weaver Street Market sponsored the Tour as a benefit for Carolina Farm Stewardship Association. Betsy designed the first tour and worked closely with Weaver Street and CFSA on timelines, etc. Now in it’s tenth year thousands of people go on the tour and it raises thousands of dollars for the work CFSA does. It is easy to go on the tour. Just pick up a map at market or Weaver St. or many other local businesses and go to first farm that you want. The best deal is to buy a button which will be your pass for as many people as you can stuff into one vehicle, for as many farms as you want. 30 farms this year so you will have to choose, it is hard to do more than 3 maybe 4 farms in a day. In the mean time we will be mowing and picking up around the place, nothing like have hundreds of house guests all at once to make you buff up the joint! Unfortunately the weather looks a bit mixed for the weekend, Saturday has a front moving in with a chance of rain and then the temperatures dropping with the wind picking up for a brisk Sunday. Come on out anyway! We have been moving steadily towards getting the main planting of tomatoes in the ground, got the Big Tops covered, beds prepared, irrigation lines down, row cover laid and today will begin to put up the 1000 feet of trellis to support them all. It is a lot of work but these luscious fruits are about 15 percent of our business each year so we make sure that it is done right. While everyone seems to remember us for our peppers (I think it is the hypnotic effect of the roaster in the fall) the tomatoes are a much bigger part of our life. We have decided to put off the actual planting until early next week due to the weather forecast. 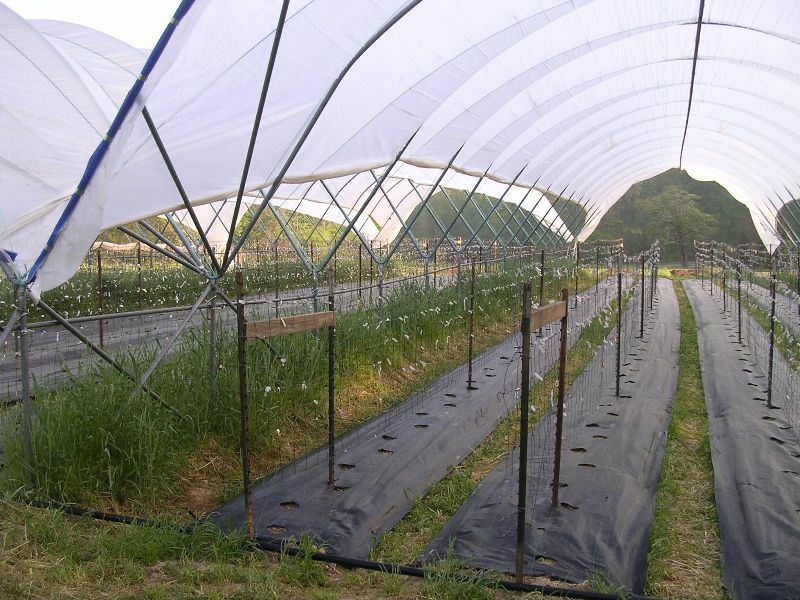 It is critical that they go in the ground and start growing vigorously without any stresses early on, it means much better plants and fruit later. 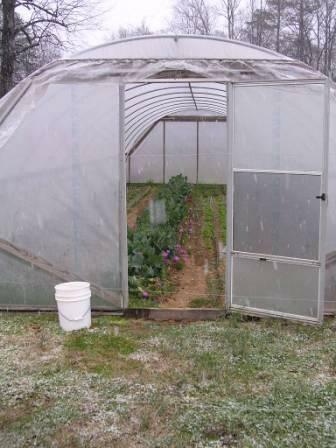 We had a good frost here on Sunday morning and had a couple of plants in the little tunnels burned a bit so we just want to be careful. I started the irrigation dance yesterday by getting the pump back down to the pond and pumping water. 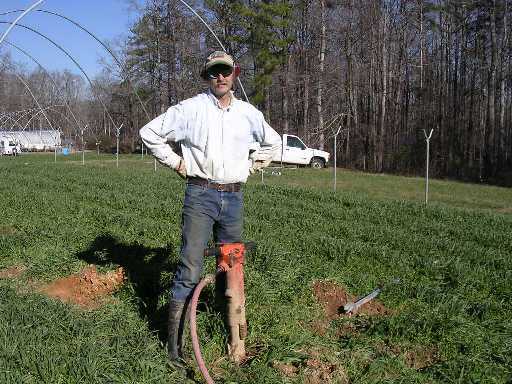 Flushed out all of the main lines running up the hill and all across the farm and then the rest of the week we will begin rolling out the irrigation lines, thousands of feet. Just about the whole top of the farm, new flowers in the front, the little sliding tunnels on the left, lettuce in the middle and the Big Tops in the back, come and see it all on the tour.